Jim Mallinder says Saints are desperate to give their supporters something to shout about at stadium:mk on Saturday. Last season’s table-toppers go into the game against Newcastle Falcons on the back of a hugely disappointing 13-12 defeat at Worcester Warriors last Friday night. Saints were unable to get going in that game and were beaten by a last-gasp Tom Heathcote drop goal. 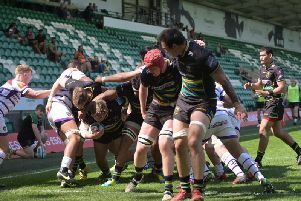 But they head to Milton Keynes this weekend in bullish mood, bidding to right the wrongs of Aviva Premiership opening night. And Mallinder said: “We’ll hopefully get the support, get the players playing well. Saints are playing the game in Milton Keynes as the finishing touches continue to be put to the new Barwell Stand at Franklin’s Gardens. The ground will be open for the first time this season when Saracens visit on November 7, but in the meantime they will return to MK. Saints last played at the venue back in April, when they beat Sarries 25-20. And Mallinder said: “It’s a good stadium, MK. We enjoy playing there, we’ve played there plenty of times before. “We’ll be okay. We’ve got a few players coming back so hopefully we can improve. “We’ve got a good training week and we’ve stayed positive and stuck together.